SNS Magnesium Creatine Chelate powder contains Creatine Magnapower®, a patented ingredient from Albion Labs that has been shown in studies to help improve exercise performance, allow athletes to reach exhaustion later in their routines, and to produce significant strength gains in as little as 2 weeks! 2,500 mg (2.5 grams) per Serving! What makes Magnesium Creatine Chelate different and why is it so special? Magnesium Creatine Chelate is highly bioavailable, and offers protection from the digestive tract. Protection from breakdown in the digestive tract is very important with creatine supplementation because it makes more creatine available to the muscle cells. Magnesium Creatine Chelate is fully reacted magnesium and creatine chelate. On its own, Magnesium is essential for over 300 bodily functions, and has been shown to enhance strength, energy, and endurance levels. The most important aspect of magnesium in relation to this product is that creatine requires magnesium for its maximum conversion to ATP. ATP (Adenosine Triphosphate) is the source of energy for muscle cells and is required for all cellular functions. When can Magnesium Creatine Chelate be used? Magnesium Creatine Chelate can be used to help build and/or retain lean muscle white dieting. Many athletes and fitness enthusiasts find Magnesium Creatine Chelate highly desirable during this period compared to regular creatine since there is limited to no fluid retention with Magnesium Creatine Chelate and there is no need for dextrose or simple sugars to be taken with it. The same reasons that make Magnesium Creatine Chelate desirable during cutting and fat loss cycles make it very appealing during lean bulking and recomposition cycles – lean muscle and strength gains with limited to no fluid retention and fat gain. Magnesium Creatine Chelate can be used during bulking cycles to help maximize lean muscle and strength gains. How does Magnesium Creatine Chelate compare to Creatine Monohydrate? Creatine Monohydrate has been shown in numerous studies to help increase lean muscle, strength, and endurance levels. However, there are some reported drawbacks associated for Creatine Monohydrate with some users including stomach distress, bloating and fluid retention, the perceived need for a loading phase, and possible fat storage related to the dextrose and simple sugars that some people use to help improve the absorption. This is where Magnesium Creatine Chelate has the advantage. It has been shown to be as or more effective than Creatine Monohydrate without some of the potential negative, unwanted side effects. Creatine Monohydrate has a lower absorption rate than Magnesium Creatine Chelate, which results in many users “loading” or taking high dosages of Creatine Monohydrate in order to achieve effective amounts in the body. With Magnesium Creatine Chelate, due to the higher absorption rate and reduced breakdown to creatinine in the stomach, there is no need for this loading phase. This results in increased convenience and cost effectiveness. Bloating and fluid retention is commonly reported by Creatine Monohydrate users; however is seldom reported with Magnesium Creatine Chelate. That makes Magnesium Creatine Chelate highly desirable for individuals that are dieting or are concerned with fluid retention. Many creatine monohydrate based products contain dextrose or other simple sugars, and many people that take creatine monohydrate powder take it with simple sugars to help increase the absorption. The downside to this is that the insulin spike created by these simple sugars can lead to fat storage. With Magnesium Creatine Chelate, due to its superior absorption, no dextrose or simple sugars are needed; therefore, there is no resulting insulin spike or fat storage. 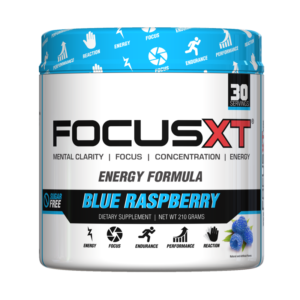 This aspect alone makes Magnesium Creatine Chelate ideal for those looking to incorporate a creatine product into their recomposition or fat loss regimen. Due to Creatine Monohydrates lower absorption rate, and breakdown into its byproduct creatinine in the stomach, some users report stomach distress. However, with Magnesium Creatine Chelate, stomach discomfort is decreased or eliminated because it has a higher absorption rate and the creatine is protected from the stomach acid, and the chelate helps prevent breakdown. Can Magnesium Creatine Chelate be used by women? Absolutely! Many women find Magnesium Creatine Chelate to be their desired form of creatine since there is limited to no fluid retention, no need for dextrose or simple sugars to be taken with it and therefore no increased fat storage, and because it is so convenient and easy to use. 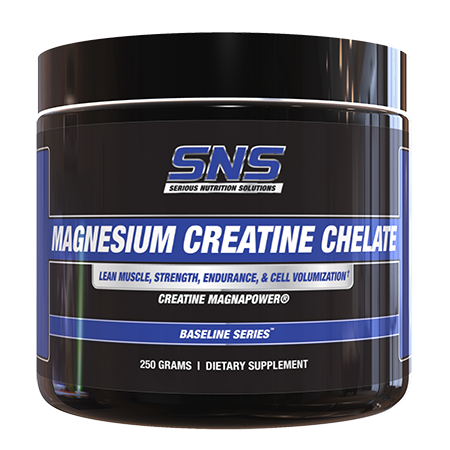 SNS Magnesium Creatine Chelate powder can be stacked with a wide variety of other SNS products for improved, synergistic results according to your desired goals! 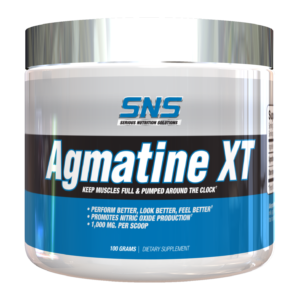 These include SNS VASO6®, Agmatine XT, Citrulline Malate, GlycoPhase, and more! As a dietary supplement, take two and a half (2.5) scoops one to two times per day.